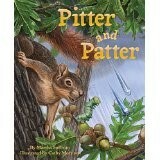 Hello, I’m the illustrator of “Pitter and Patter” and very much appreciate your review. I absolutely love how Martha Sullivan writes and is able to communicate complex concepts to kids in a fun and creative way. I hadn’t thought about the water cycle in years and now I’m fascinated about it all over again. Hopefully kids will feel the same. Thank you so much for your kind words. I’m so glad you found the review and I hope the sales reflect the quality of this book. It can’t reach too many readers. Double thanks! It’s great to have so many like-minded people trying to spread the word about the importance of nature in our children’s lives!